HIGH-SPEED STORAGE FOR HIGH-RES PHOTOS AND VIDEOS. The SanDisk Extreme 500 portable SSD is less than half the size of your smartphone and delivers up to 4x the speed of a portable hard drive. Get to work in seconds, transfer big videos and photo libraries at up to 440MB/s— a speed that portable hard drives can only dream about. Designed for durability and style, this drive is amazingly compact and has no moving parts to break. Solid state technology offers reliable, responsive, high-performance storage for photographers and videographers who capture and carry lots of big media files. When you care about your day’s work, it pays to make the SanDisk Extreme 500 your portable storage drive. SPEED COUNTS: Who wants to spend precious time waiting, waiting—for big files to transfer and open? The SanDisk Extreme 500 portable SSD speeds up the pace of business for fast-moving photographers and videographers. Time is money after all. SIZE MATTERS: The SanDisk Extreme 500 portable SSD is both very small and very big—a few inches square and available in 120GB, 240GB, 250GB, 480GB, 500GB and 1TB of portable storage for on-the-go media pros. Think of it as power in your pocket—or your camera bag. TRUST A TOUGH GUY: Bump it. Drop it. Leave it in the hot or cold. 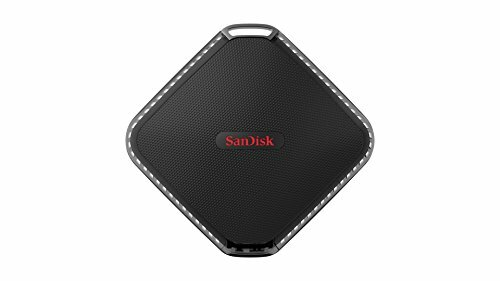 The SanDisk Extreme 500 portable SSD is built tough to resist shocks, vibrations and temperature extremes. PROTECT YOUR PRIVACY: SanDisk SecureAccess software uses 128-bit encryption to keep private files from prying eyes. STAY COOL: Hard drives generate heat. They can’t help it, it’s how they’re built. The SanDisk Extreme 500 portable SSD is a cool and quiet companion and a solid partner on even the busiest of days. Publisher: Western Digital Technologies Inc. Studio: Western Digital Technologies Inc.